I have long felt that most companies and websites are failing hard when it comes to getting social right. The advent of changes to Facebook and the addition of services such as Google+ haven’t swayed my opinion much. We are simple creatures. We may clamor for shiny new toys which give us more options but at the end of the day we want easy control and basic features. We don’t need bells and whistles – we need a place where we can share and consume information without a bunch of clutter getting in the way. I applaud the WSJ for attempting to bring the news to the place they feel I would want to read it. I understand that they’re trying to win back page views in a world where much of our reading is done on Facebook. I just don’t think they’re getting it quite right still. Instead of having WSJ articles showing up on my already far overcrowded Facebook wall, why not introduce a fantastic new social tool within their own site? Give me simple ways to read, bookmark, highlight, comment and share your stories without having to log in elsewhere and I’m there. Show me how your site can stand out above other news offerings by giving me SIMPLE tools which allow me to do what it is I logged online to do in the first place. 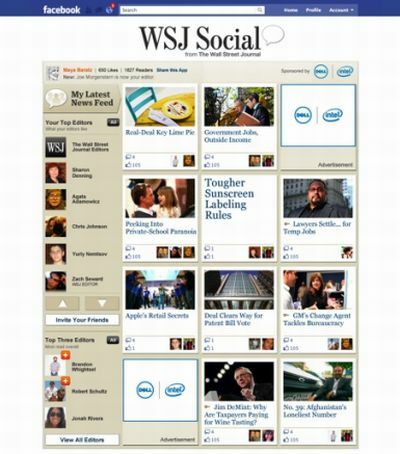 I don’t want to see the WSJ on my Facebook. Sadly, this application will be blocked along with hundreds of others already on that auspicious list. I would make a comment about how Facebook is not the sum total of the Internet but that’s a rant for another day.